Scrappin' With Tammy: Happy Birthday, Tracey! Today I need to wish my little sister a very Happy Birthday! I told her that I would not tell my blog readers how old she was, so I won't! 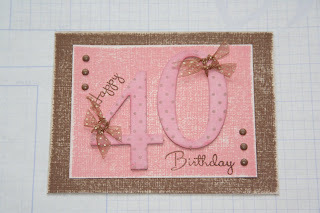 I will keep my word...however, here is the card I made for her :) This card was made using our textured cardstock. I sanded the surface of it to let the texture show through a little more. I also used our dimensional elements numbers. I stamped them using a polka dot background and then inked them up in pink ink, tied some polka dot ribbon on, and attached them to her card. I then added some brads to add a little something something to it. As always, feel free to click on the photo to see more detail. This is the textured cardstock that is on sale this month. See the "Hearts for Haiti" link on the left side of my blog for more details-or scroll down to where I explained it all for you. Let me know if you are interested in ordering (or feel free to go to my website and order it for yourself) as it really is a great deal!